Approved for 2.0 CEU in Private category 1, Commercial categories 1a and 10. 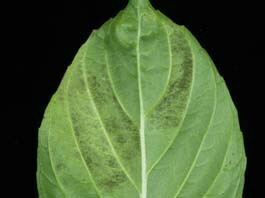 Basil downy mildew (Peronospora belbahrii) is normally more intense during a cold and wet winter season and less pervasive during hot and dry weather. Infected plants will turn yellow, with symptoms closely resembling some types of nutrient deficiency. Eventually brownish spots will form, resulting in an unmarketable crop. We will be holding an educational field day event in coordination with CTAHR’s IR-4 program and Basil SWAT Team to showcase basil downy mildew symptoms, fungicide screening trials, and IR4 program’s ATV mounted spray boom. We will talk about available risk management measures to manage downy mildew this season, demonstrate calibration of a boom system, and also help growers understand how to establish effective field trials at their respective farms. Commercial categories 1a and 10. Use of pesticides by unskilled or unknowledgeable applicators poses public health risks due to chemical residue in produce and the environment. We will be conducting an educational session with farmers to address basil pest management and pesticide application priorities brought forth in a needs assessment conducted by the LIFE program. LIFE members will start off the afternoon by demonstrating how an adjustment to 1 spray variable (speed, pressure, equipment, crop type, etc.) can cause a significant change in sprayer output (application). We will show you how to calibrate an orchard gun using the 1/128 calibration method. Mr. Steve Russo of the Hawaii Department of Agriculture will then cover the importance of pesticide calibration, pesticide and crop groupings. Following this, we will cover major basil pests and talk about best management practices which will include applying the correct crop protection chemical for the appropriate crop pest. 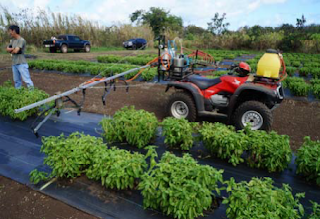 Lyle Wong will provide an update on the Kunia Irradiator project and talk about the potential of treating basil for export. Come on down and visit our trade show vendors of agricultural chemical companies and various government agencies. For information or to request an auxiliary aid or service (e.g., sign language interpreter, designated parking, or materials in alternate format), contact Jensen Uyeda (juyeda@hawaii.edu) or Jari Sugano (suganoj@ctahr.hawaii.edu) at (808) 622-4185 at least seven days before the activity/event.